You May Have Glaucoma or Retinal Disease And Not Know It.. Conditions like glaucoma are more common as we get older and can be present in your eyes without any noticeable symptoms. People sometimes ask us why they need to visit Bay Eye Care for routine eye examinations when they feel they can see just fine. The main reason is to check for problems in the back of your eye, such as conditions like glaucoma or retinal disease. These diseases can develop without any change to your sight and in most cases the damage to your eye is irreversible. Fortunately with early diagnosis and appropriate treatment most disease processes can be slowed or halted altogether. At Bay Eye Care we use advanced diagnostic equipment to monitor for signs of problems in the back of your eye. This includes retinal scanning (known as OCT), ocular photography, autofluorescence imaging, visual field testing, pressure testing of the fluid in your eye (known as IOP) and measurements of the thickness of ocular tissue. Measuring the pressure within the eye with cutting edge diagnostic equipment. Visual testing to look for signs of glaucoma. Sometimes called the 'silent thief of sight', glaucoma is an insidious condition that causes gradual loss of your peripheral vision initially, then later central sight as the disease advances. In New Zealand glaucoma is the leading cause of preventable blindness. 2% of people over 40 years of age have the condition, increasing to 10% as we reach 70 years. Because it is almost impossible to detect peripheral vision loss, glaucoma can develop without you realising. Visiting Bay Eye Care for regular consultations can diagnose glaucoma before it does any damage. The optic nerve of a person with glaucoma. The blue arrow shows the damaged area of the optic nerve. The black blotches in the graphic shows the vision loss in the top half of this person's sight. All glaucoma comes about due to damage to the optic nerve of the eye - the 'wiring' that carries visual information from our eye to our brains. There are many different forms of glaucoma, however the most common, primary open angle glaucoma, occurs because the pressure in the eye increases to a level that is harmful to the optic nerve tissue. Glaucoma is more common as you get older and if you have a family history of the condition. Refractive conditions like short-sightedness also make you more likely to develop glaucoma. What can be done to treat glaucoma? The only way to currently treat glaucoma is by lowering the pressure of the eye to a level that is unlikely to cause further damage to the optic nerve. This can be done with daily glaucoma eye drops, laser glaucoma procedures or glaucoma surgery. Our optometrist Mr Alex Petty is the first optometrist in Tauranga to be able to prescribe glaucoma medications independently. He has treated glaucoma for a number of years, following a period working in the glaucoma clinic of Palmerston North Hospital. Glaucoma NZ has an excellent website (www.glaucoma.org.nz) full of resources if you are interested in more information. The view of someone with a moderate level of glaucoma. The retina is the light-sensitive tissue on the inside of the back of our eyes. The are a number of conditions that can affect the retina and cause problems with vision. The most common retinal diseases that we see at Bay Eye Care are age-related macular degeneration and diabetic retinopathy. Retinal detachment can also be a catastrophic problem in people with myopia. An eye with macular degeneration. Note the yellow debris or 'drusen' in the centre of the retina. As we get older waste products accumulate in our retina. These can interfere with the normal functioning of the eye at the macula - the central part of the retina that we get our best vision from. Macular degeneration affects ~15% of us over the age of 50 in New Zealand, and is 3x more likely in smokers. Most macular degeneration is the 'dry' form and slowly worsens over time. Approximately 10% of ARMD is the 'wet' form, which occurs when fluid or blood leak into the macula, causing it to distort. Wet ARMD can develop quickly and can cause permanent blindness if left untreated. An OCT scan of a patient with macular degeneration showing the debris or 'drusen' building up under the retina. Currently not much can be done for dry ARMD except altering lifestyle factors such as improving diet, exercising regularly and stopping smoking. If you have wet ARMD prompt treatment with injections from an eye surgeon can improve the swelling in your retina. Our optometrist Mr Alex Petty can easily detect and monitor the different forms of ARMD and arrange prompt treatment for you if necessary. This informative video from Macular Degeneration NZ summarises the condition and describes a simple screening test that you can do at home. Macular Degeneration NZ has an excellent website (www.mdnz.org.nz) with resources and information about ARMD. People with high myopia (short-sightedness) can also get a form of macular degeneration, however this is caused by thinning of the back of the eye due to their stretched eye ball shape. An OCT scan of a diabetic with swelling in their retina due to poor control of blood sugar levels. Normally the retina is smooth and even with no blue spaces (fluid). Diabetes is a condition that affects ~7% of New Zealanders. There are different forms of the condition but all result in increased sugar in the blood. These sugars can cause changes to the blood vessels in the eye, resulting in bleeding, swelling and scarring of the retina over time. 70% of diabetics will have eye changes within 15 years of their diagnosis. If you are a diabetic it is important to have your retina and vision thoroughly checked by your optometrist at Bay Eye Care at least every 2 years. If serious retinal problems are detected you made need referral to an eye surgeon (ophthalmologist) for treatment. Diabetics also have other problems with their eyes including increased risk of dry eye and cataracts. Diabetes NZ have more information about the ocular effects of diabetes on their website (www.diabetes.org.nz). 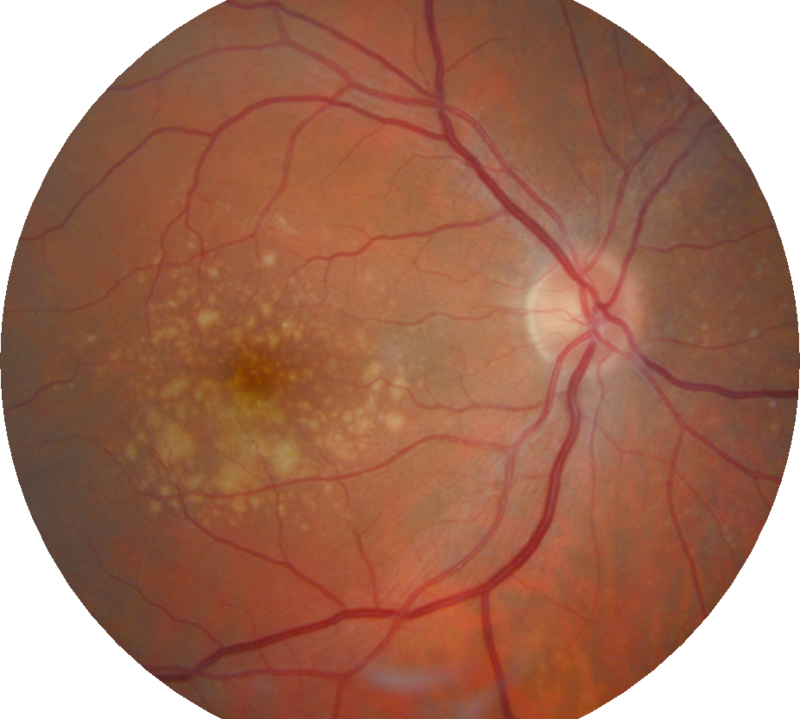 A retinal photo showing the damage to the upper retina following surgical repair for a retinal detachment. Retinal detachment is a potentially blinding condition that occurs in 5% of patients with high myopia (short-sightedness). Other causes include trauma and diabetic retinopathy. In a retinal detachment the thin light-sensitive retinal tissue on the inside of the eye separates from the other layers of the eye. This tissue needs to be urgently repaired back in place with surgery to avoid loss of vision. Symptoms that you may experience if you have a retinal detachment include bright spots or streaks of light in your vision (flashes), drifting specks or blurs (floaters) or loss of peripheral vision. If you notice any of these symptoms contact Bay Eye Care urgently to have your retina checked for holes, tears or detachments. Bring someone to drive you home as drops that dilate your pupils will be used to help our optometrist Mr Alex Petty check the integrity of your retina.